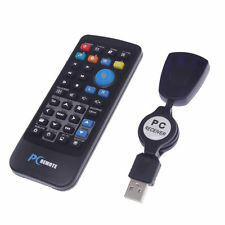 For less than $4, this remote set was detected and can be used as a keyboard and a mouse. - Use as a keyboard to select an OS in NOOBS boot menu. Switch or add more as you like. - Not includes keys that not working. - Read carefully for <'color'>s and <numlock> buttons. It's like Raspberry Pi of ir remote world. # !!! avoid pressing / using !!! Last edited by rern on 24 Mar 2018, 14:27, edited 7 times in total. Also, are you saying that that particular ebay USB remote can be *modified" using JP1 Remote software (i.e. key functions changed/modified on the remote itself)? That would be a great help, since I still have several of those, and don't use them because of the pesky "NumLock" key, which changes the remote behavior, and is easy to accidentally press (and suddenly the remote doesn't work any more....). Last edited by rern on 30 Aug 2016, 14:04, edited 2 times in total. Brilliant! I was just about to post a question about this very device when I found this post. Now I can pause the Pi. After some faffing about with PuTTY and with reference to http://ss64.com/bash/ to learn some console commands, and a bit of hacking with the vi editor in particular, I managed to find the /root/.xbindkeysrc file and insert these statements. Since this device works without these hacks in Windows, out of the box, as do other "standard" USB IR remotes, I do wonder why they (or similar keypresses) aren't built into the distro or Rune. Maybe I'll never really get Linux. Anyway, thanks for passing on the info! For anyone else considering this, and with limited/no Linux experience, here are some tips from my experience. Firstly, forget about PuTTY and other SSH utilities to log on to your Pi, unless you are already Linux-friendly. If you have Windows, install WinSCP, which allows you to log onto RuneAudio and exchange files with your PC, through a user-friendly interface. Default userID/pwd for Rune are root/rune. Obviously you need to know the IP address of your Pi, and it helps if you have setup your router so that the Pi keeps the same IP. Secondly, set WinSCP to show hidden files, because the one we want has a name which starts with a ". ", so it is hidden. Thirdly, when you copy the file (.xbindkeysrc) to your PC, don't start editing it with Notepad or Wordpad, since there is something about the end-of-line characters in Linux/Unix which is different to Windows. When you send it back to the Pi, xbindkeys won't read it properly. I use the PFE editor to avoid this, which has a default unix-style end-of-line. Finally, here is a cleaned-up version of the command file which I used after some experimentation. It uses the skip and back keys for track changes and the left and right arrow cursor keys for seeking back or forward by 10s. Up and down are redundant. I couldn't find a way to stop/start (apart from the <enter> key for pause/play), or mute. I gave up experimenting since you have to reboot the Pi every time you load a new command file. I couldn't find any definition of keys which included the codes used by the OP. I have commented out the commands which do not work, to avoid trying them again. Would be interesting to know where those last few key codes come from, like "m:0x0 + c:113", or if anyone got stop/start or mute to work. Stop/start would resume at the beginning of the present track in my logic (or maybe at the beginning of the playlist?). Also it would be good to be able to restart the current track, without going back one and then forward one. thank you for pointing this out for beginners. Thirdly, when you copy the file (.xbindkeysrc) to your PC, don't start editing it with Notepad or Wordpad, ..... I use the PFE editor to avoid this, which has a default unix-style end-of-line. Even better in my eyes is to use Notepad++. You can set it as default editor for WinSCP, so no need to transfer the files forth and back. You can edit them directly on the device within WinSCP. Would be interesting to know where those last few key codes come from, like "m:0x0 + c:113"
These codes are for non XF86Audio keys. or if anyone got stop/start or mute to work. Mute is not possible to implement the easy way, because mpd doesn't support it out of the box as command. I gave up experimenting since you have to reboot the Pi every time you load a new command file. But where can we find the list of key codes which includes these and other keys? All the key codes I can find from googling around look nothing like these codes (m:0x0 + c:113). How can I find this code? Thanks for the mpc command list. Once I find the codes, I can use a few more of them. All help much appreciated. It's making RuneAudio better all the time. I think there is a bug somewhere with updating the UPnP playlist. If you go to next track, the UPnP playlist shows this, but if you go to the previous track, it plays the previous track, and the playlist is still showing the current track as unchanged. But where can we find the list of key codes which includes these and other keys? I think there is a bug somewhere with updating the UPnP playlist. -k ....... detects a single key at a time. -mk ... detects multiple keys. Launch PuTTY SSH without retyping login and password. By the way, @MarmiteSandwich can identify some key codes that even xbindkeys can't detect. Please share the trick.